In an advertising campaign that would make Don Draper proud, the Battersea Dogs & Cats Home is using interactive billboards in a London mall to help find forever homes for its pets. Here’s how the ingenious #LookingForYou campaign works: As shoppers approach the Westfield Stratford City mall, representatives from Battersea hand them leaflets with hidden tracking tags. When the shoppers pass the electronic billboards throughout the mall, it looks like Barley, a scruffy, soulful-eyed former Battersea resident, is following them. “We’re very excited about the #LookingForYou campaign — as a nation of dog lovers, we’re hoping it strikes a chord with people,” said Carly Whyborn, Battersea head of operations, on its website. Adweek praised the campaign today, proclaiming it the “Ad of the Day.” The concept is “a simple high-tech tug at the heartstrings to remind Brits of the life-changing magic adopted pets can bring to their lives,” wrote David Gianatasio. The campaign was designed and produced by OgilvyOne UK. Several other companies contributed to the project, including Cisper Electronics, Creation Company Films Limited, Exterion Media, Framestore, Intellifi, Kevin Mallett Photography, Mount Pleasant Studios Limited, REAL Digital International Limited, RFIDiom and Westfield Stratford City. 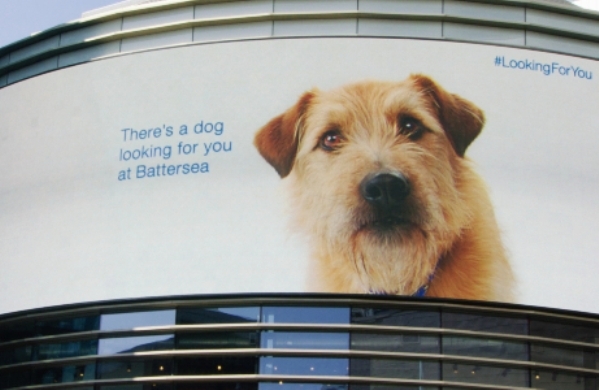 Here’s hoping Battersea soon finds its kennels empty, and OgilvyOne UK wins a well-deserved advertising award.